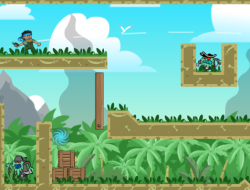 The pirats have invaded the jungle and your team has been sent there in this skill game to clear it of any hostiles. Throw grenades at them and make sure that they land and stay near them until they explode. Sometimes you wont have a clear shot and it is best to throw the grenade to a friendly or hit something else that will send it flying in the right direction. The faster you will kill the enemies in each level the more points you will get. Try to move fast and hit the replay button if you didnt get to finish a level or you are unsatisfied with the score. Jungle Wars 0.00 between 0 and 10 based on 0 votes.